Sometimes just making it through the day is enough, particularly when my mind pins me to emotional distress crying out for reconciliation. Anyone understanding this discombobulated statement? 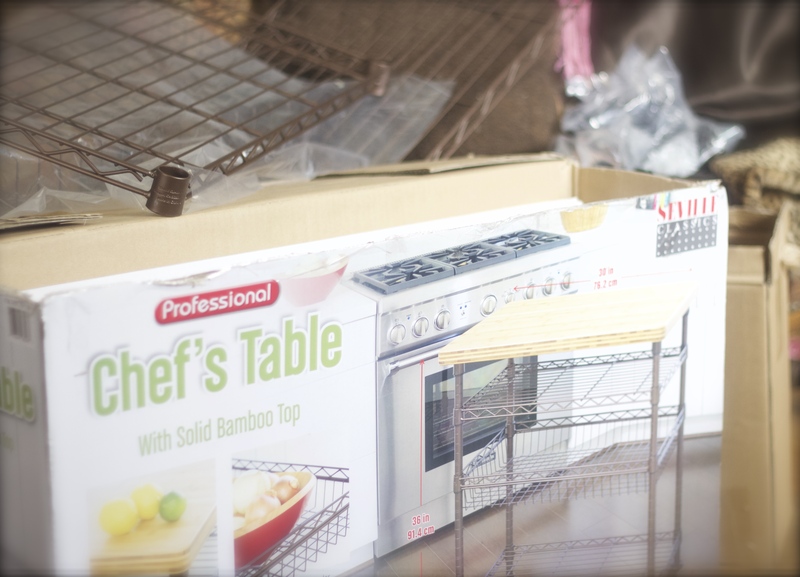 The real issue with a “tiny kitchen” is space… the lack of sufficient space to store things and the perpetual makeshift rolling work space. A few weeks ago, I walked past and backed up to “study” a chef’s table at Costco. It was just neat and perfectly sized for my tiny kitchen. The box was heavy and not an associate in sight to assist me… I fell back on “Well, if it’s for me… we’ll see.” (Cop out! Cop out! Cop out! Once again shirking responsibility for making things happen in my life.) Having to return and swap out a defected contact lens, entering the store I felt some urgency about this table. Besides, my big strapping son accompanying his temporary vision-impaired mother on this errand could do the heavy lifting. Chef’s Table… The Living Room is my work station to assemble the newest addition to my “TinyKitchen” Only one left and an associate stocking shelves knew immediately after I described the table, where he had just placed this lone chef’s table. He laughed saying, “Uno, Uno… Just one left in store.” It was mine! I told him Gracias! After struggling for a couple of hours to assemble my new “support,” it was in its rightful place. My initial plan was to create a beverage bar. A guiltless addiction includes a tea assortment designed for stress managements as well dark roasted coffees. 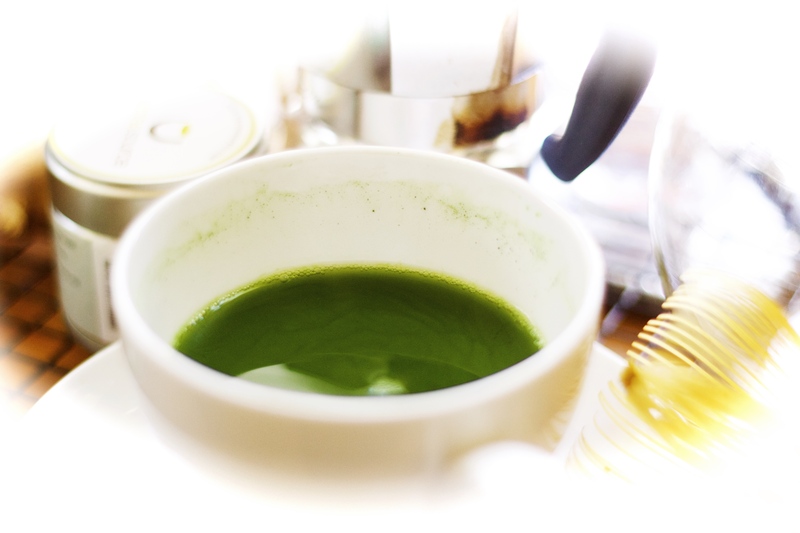 (My favorite tea is ti kuan yin and just recently I’ve added the *Matcha tea. As you can see, my chef’s table is fully occupied. What happened? I have not emptied cabinets or pulled anything out. In fact, I recycled some old, unused kitchen equipment. 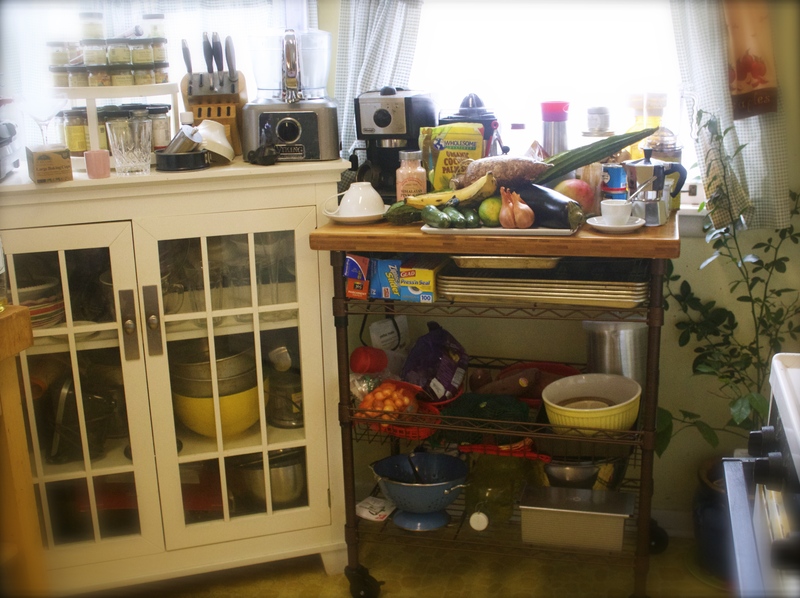 Only my espresso makers and tea pots have been transferred from the butcher block island to the newly installed chef’s table, but the former is still full and now aside from recently purchased fresh produce both tables. This past week, letting my mind relax, I was able to bake my first-ever loaf of “sliced” bread using a Pullman loaf pan. (Inspired by last weekend’s Martha Stewart Bakes episode.) 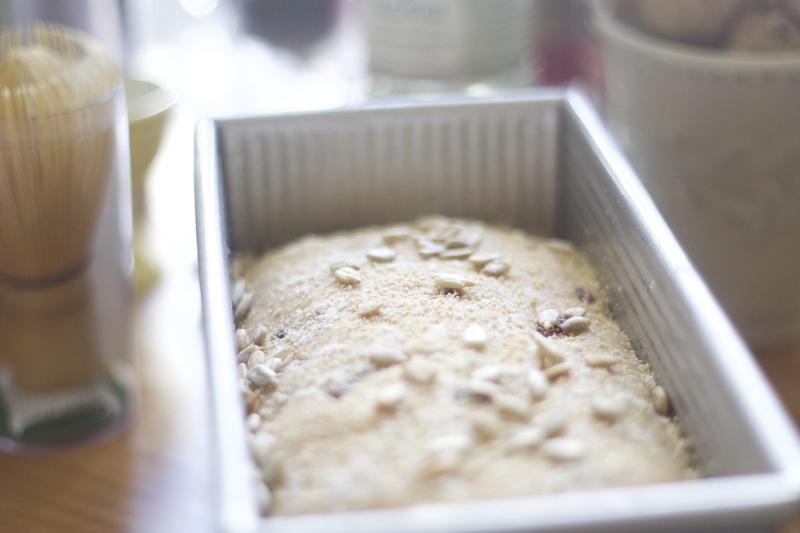 I baked a Honey Loaf using organic spelt flour. I learned to bake bread using nature’s tools to knead the dough… Yes, my hands.. However, the dough hook works great for me… Experience teaches you to “feel” when the dough is ready regardless of your method. I prefer ancient grain breads because they are nutrient rich and the health benefits from flours made with long grains far exceeds the more commonly used shorter wheat, including they are easier to digest and provide a great deal more Vitamin B and iron. The smell of bread baking is calming and is not as labor intensive as some people believe. Rather, it is like anything else you enjoy… After investing the time to “master” whatever your pleasure is, the work becomes natural and quite pleasant… almost therapeutic. 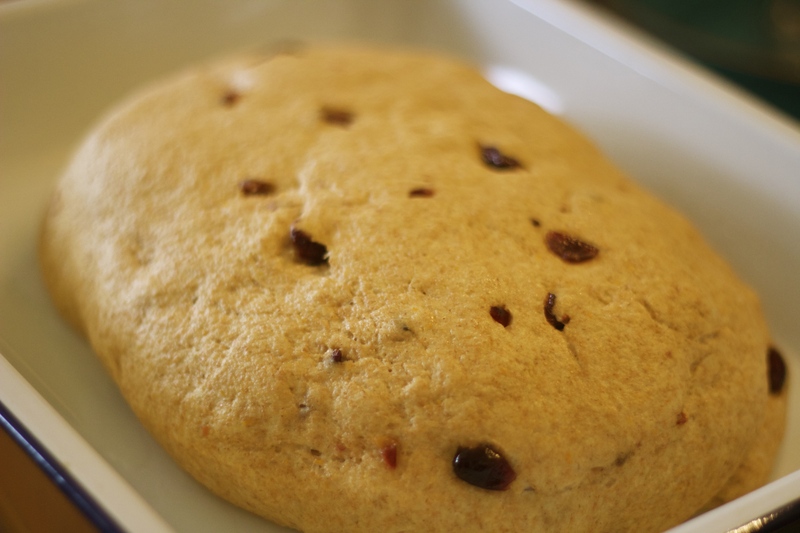 Orange zest, dried cranberries and honey are incorporated into this particular recipe. A spontaneous decision to top the unbaked loaf with sunflower seeds, oats and sprinkle on honey crystals proved delightful. What makes it really worth while, however is the end product. A hot loaf of organic bread, GMO-free and made from basic ingredients in your kitchen. 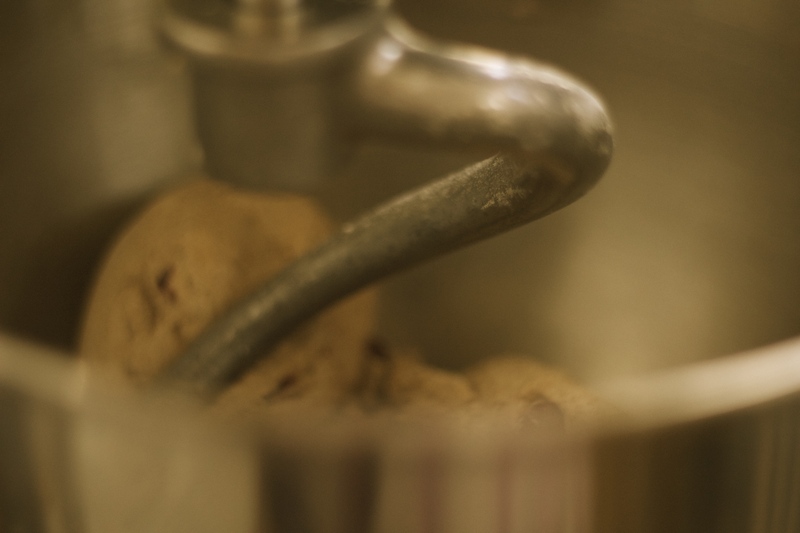 Dough rising… Exciting! I just removed the plastic covering and now it is time do the final press and form in Pullman Loaf Pan. 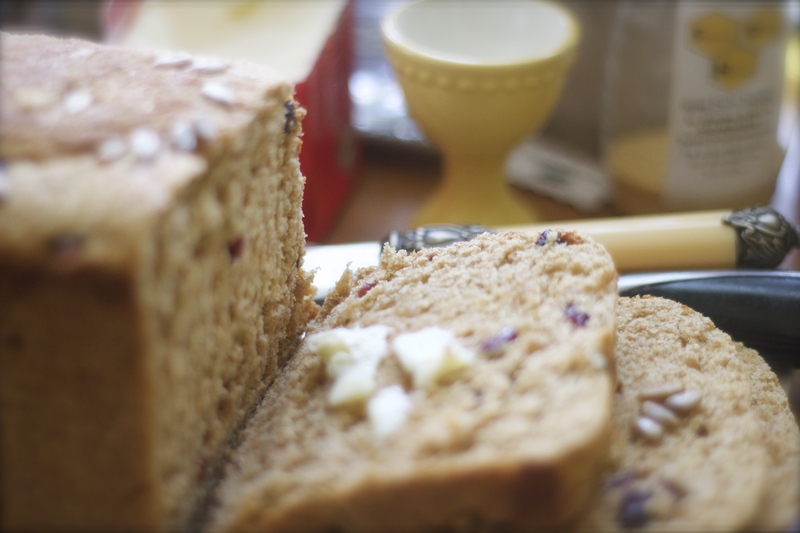 Using a sharpened knife, slice bread and then butter your slice for a delicious treat. My first ever loaf and it was as Martha Stewart would say, “A good thing.” We had open-faced sandwiches the next day using “saved” slices of a roast pork tenderloin. A lot goes on in this brain of mine… The voice of reconciliation cries out of pain to “set me free.” … Perhaps unfinished emotional business is the root of depression. Yesterday, I purchased and devoured a slice of Tres Leches cake and potato chips. Afterwards, the despair at doing something so ridiculous reawakened me to unresolved personal issues… How do I control the pen… or simply let it go to heal my brokenness? God is painstakingly bringing me, my self-doubts and fear to this place… I have often believed even through the long-suffering task of being my son’s primary caregiver a prayer I prayed long ago will resolve itself through this experience. What was the prayer? Lord, make my feet like hind’s feet to stand upon my high places. Signing off from my more efficient TINYKITCHEN, where today GREATTASTE‘s are on the menu to feed a BIGHEART… Working to keep it healthy and now I’ve discovered my Matcha! *Matcha is a green tea powder masterfully blended from handpicked, shade-cultivated leaves to boost health and wellness. Use a bamboo whisk and slightly hot water to mix. Through love we steal from the time that kills us a few hours which we turn now into paradise and not into hell. In both ways time expands and ceases to be a measure. Beyond happiness and unhappiness, though it is both things, love is intensity: It does not give us eternity, but life; that second in which the doors of time and space open just a crack: Here is there and now is always. In love, everything is two and everything strives to be one. Octavio Paz… The Double Flame: Love and Eroticism. © This article and photographs are the property of J. Faye Guider Productions. Feel free to ask me for permission to use my material or make requests, including for recipes, in the comment section. Thank you.